I, as well as many, love so much to read a positive post, to hear how well some are doing and how well they are moving forward in this life that none of us wanted or ever envisaged. They are wonderful posts and give us hope and something to hang on to in those days when everything is so raw and we question whether we will ever survive this pain and heartache that wrecks our bodies, our minds and throws aside everything we thought we knew about ourselves ...... the "me" ..... the "us" that we know no more. The nature of BUK, however, is where we come, when we can no longer face the outside world, when the pain and the grief overwhelms us and we know not where to turn. When the supporters disappear expecting us to be over it, when the friends and family that should be there, just aren't, when we cant face getting out of bed, when we cant find the "front" to put on to the outside World ...... BUK, is where we turn, knowing we can pour out our hearts and people there completely understand. It is exactly for this reason we cant always post something positive ..... It's our SAFE place where we can say it exactly as it is and know that support is there, without judgment. The one thing we must all take on board, above all else is that there is NO right or wrong way to grieve. There is no time limit. We all proceed at our own pace and that is the pace that's right ONLY for us. 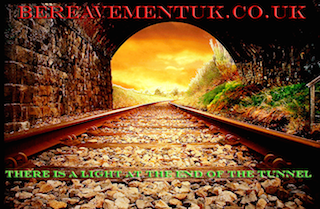 Many deal with their grief a lot quicker then others, many never deal with it at all. NEITHER IS WRONG. Some make bucket lists and embrace everything they might have wanted to do before but never could, maybe because having a disabled partner or parent stopped them from doing do. Many move home, some because they are forced to financially, others because they cannot live with the memories. Many go on to new relationships. Many hit drink, cigarettes, poor diets and chocolate and barely get out of bed. Others become gym fanatics, run marathons in good causes or fight for justice in the belief that "something good must come from something so bad". NONE is RIGHT nor WRONG ...... It's just what we need to get us through this awful pain and place in our lives. I am always so, so pleased to hear that someone is making headway, as well as how they have achieved it. So too, I confess it makes me question "What am I doing wrong, why am I not making progress?" Like many on here, now at a similar stage, I'm shortly to hit my 3rd Anniversary ...... I'm entering my 4th year of bereavement. In those early raw days I fluctuated between not wanting to move forward for fear of forgetting him, and I didn't want to forget, or of thinking, I wish I was two years further down the line so I knew I had "survived" this, "got over it", so great was the fear that I didn't know how to go on ...... how stupid that now seems looking back ! Well, I'm double that now, yes I know I've survived it, but I still don't feel like I'm living and there are many times I still feel I'm making no progress ...... it doesn't mean what I'm doing is wrong. Most of all, now, I know there isn't any "getting over it" just learning to live with it and acceptance of the fact that the life I/we dreamed of/envisaged/planned, was laying foundations for is gone and I can never have that back. So very many of us have outside influences that impact greatly and add to our grief that can delay our Bereavement, some call it complicated grief. Yes, I guess it is complicated, they are factors outside our control mostly. Be it financial problems/restrictions, forced to leave our homes, loss of our jobs because employers don't understand or we cant face going back, disabilities that keep us confined to our homes meaning we cant socialise ...... every single one impacts greatly and can stop or delay us making progress and moving forward. That is why dealing with grief can only be OUR way, at OUR pace, what we can manage or we cant. BUK, as I see it, is like a big boat where we are all afloat together, lost at sea in the storm of all storms. Being thrashed against rocks, drowning in water, trying to stay afloat on this boat whose rudder is broken, that we have no control over, where we cant direct which way it's going to go. We hang on for dear life, supporting each other. At sometime or another each of us will step in to our own little life boat and launch ourselves free, heading for calm waters and the shore that is calling us. Many of us will make it, in a year, in four or maybe even more ..... some of us might never. We will each reach our own shore where we can "survive" once more, where the sun might be out, where peace might be found, but where life and all we knew, friends and family included might be very, very, different. Many will get to shore but might not be able to get out without help. Many will be dragged under, almost drown in just the attempt and be rescued by the big boat before they try it again. Many will not lower the life boat at all. Where ever you are, what ever you do, just know it's right for YOU .... no RIGHT, no WRONG, it's what works for YOU !